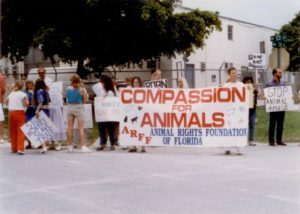 In 2013, Primate Products closed its quarantine facility in Doral (7780 NW 53 Street) after an aggressive campaign by South Florida Smash HLS. For the first time in many years, the building sat empty. Smash HLS can confirm that the building is in use again, monkeys are again imprisoned inside its windowless rooms, but now the jailers are Worldwide Primates. It’s a homecoming of sorts for Worldwide Primates’ founder Matt Block. In the 1980s and 90s, Block operated out of the building importing and selling exotic birds, monkeys and other animals. In 1994, after Block was sentenced to prison for smuggling endangered wildlife, the building was sold to Primate Products. The new owners described the building as “a filth pit” and they were forced to completely renovate it (read more of their impressions of Matt Block here). 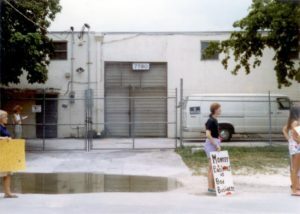 The building is still a dump, but after dozens of Smash HLS protests we’ve learned that the location is great for getting close to employees and suppliers, monitoring shipments, and loudly exercising our free-speech rights! We’re looking forward to returning once again to protest outside the building in the near future. We hope you’ll join us!